Small Size The 8002D model in compact enough to be stored in tight spaces without compromising efficiency or power. Comes with Accessories : The serger comes equipped with two screwdrivers, tweezers, needles and additional accessories. Versatility: The Janome 8002D has the right features to allow the user to work with various fabrics including very thin or very thick materials. Easy to Use This serger is powerful but still easy to understand and operate, thus it is a suitable option for beginners as well as professionals. Threading: For those new to using sergers they make find it difficult to thread the machine properly during initial attempts. Janome works to provide customers with high-quality sergers that can appeal to amateurs as well as experts. The Janome 8002D is one of those machines and it is built to be durable and powerful while still taking up little space. Its small size, however, does not compromise the features it provides for users to completely express their creativity. The Janome 8002D serger is capable of producing professional results at home. It has a thread capability of 3 to 4 threads along with the ability to sew, cut and finish seams in one action. Stitch types vary greatly and help produce perfect seams for high-quality products. These types include flat locking, chain stitching, cover hems and rolled hems. The serger also features a rolled hem device that makes it simple to convert to this stitch function. The serger’s built-in rolled hem feature helps create a professional finish. The hemmer rolls the fabric over itself to hide the fabric’s edges. The roll is sewn while also being rolled up. This provides a smooth professional edge needed to make quality garments and upholstery. A simple dial allows user to change the width of the fabric. The width can be cut from 3.1 to 7.3 millimeters. The color-coded threading chart takes the hassle out of threading the 8002D while the rolled hem conversion allows users to change from regular function to rolled hem mode without having to remove the needle plate. The differential feed dial will help decrease the incidence of bunching or stretching that can occur with thin or stretchy materials. 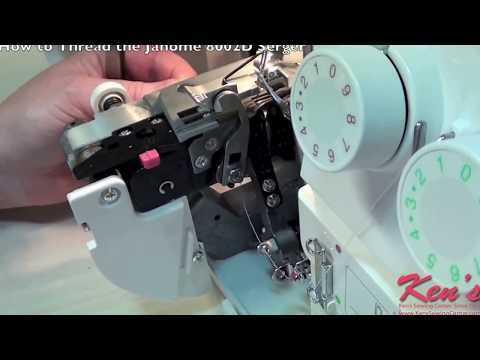 The ratio for the Janome 8002D is 0.5 to 2.25. To prevent bunched edges the differential feed dial is best set between 0.5 and 1.0. To prevent loosening of fabric it is best between 1.0 and 2.25. The lay-in thread tension dial provides equal tension between the top and bottom threads to prevent threads from looping on top of the seam or below it. The tension will automatically tighten the top tension when loops form on the bottom or loosen the top tension if loops are on top. The included workbook teaches users how to utilize every stitch. While meant for beginners the feature can also prove beneficial to enhancing the skills of expert-level users. Click Here to See Janome 8002D Serger Pricing, Pictures and Reviews on Amazon! The Janome 8002D serger provides a wide range of serging options in a compact machine. It is as versatile as it is durable and offers many options for user learning, practicing and creation. Additionally, it costs significantly less than many sergers that offer even fewer features for the price.